A big part of this move for us, was going through everything in our apartment in Montreal. EVERYTHING. We sold a few things to friends, which was fun and friendly and we are so grateful that we had friends who needed the things we were getting rid of. Most things, however, were sold on craigslist or kijiji, which is not a process I would willingly undertake ever again. It made sense financially to sell what we could, but selling in volume on the internet means that you get all the most inconsiderate people to deal with (along with a very few totally nice and reasonable people). If you ever try it, be prepared for people who ask for stuff for free, people who want you to deliver even though you've said in the ad that you can't, people who ask lots of questions without wanting to actually come buy anything, people who ask you to call and provide a wrong number or have no idea what ads they responded to, people who don't show up or show up an hour after they agreed to, and on and on. If you haven't had this experience yourself, you are forewarned! For all the stuff that didn't sell, no matter how much we thought it was worth, we "threw it on the fire", our phrase for donating it to the Salvation Army. It added a gleeful feeling to getting rid of things ("What about this?" "Throw it on the fire!"). From our perspective, everything we kept would cost us money to either store or ship. We got rid of a lot, but it still feels like we saved a lot, and I'm sure that we'll get back and look at some things and say WHY?! But so it ever is when you box things up and don't look at them for awhile. We mostly stored books, art, and nice kitchen things (lots of them wedding presents). The decision-making involved in going through all our possessions was the biggest part of the work before we left Canada. Having spent a couple months forcing myself to really evaluate my Stuff with the most vicious eye has had a lasting effect. I am feeling very hesitant about getting new stuff here, despite the fact that we actually need things now. I still feel like I have too much and when we've actually unpacked (we're still living out of suitcases), I won't be surprised if I immediately box up some clothing. Part of my hesitance to acquire is that I never want to be living with such an over-abundance of Stuff again. This intense de-cluttering forced us to not only get rid of the obvious things that we'd just been too lazy to deal with (e.g. an old stereo we weren't using anymore), but also to examine even things we thought we were attached to. Much as Europe will be filled with flea markets and thrift stores and pretty things that aren't available at home, I am going to try to enjoy these things with Restraint. Being faced with all my clutter has made me want a place with empty spaces, to not have everything already filled in and filled up. I think North America's obsession with huge living spaces with lots of hidden storage leads one so easily into acquiring and then Keeping so much more than we actually need. I'm hoping that a lack of cupboards and a smaller space, coupled with my self-awareness will be the cure for me. 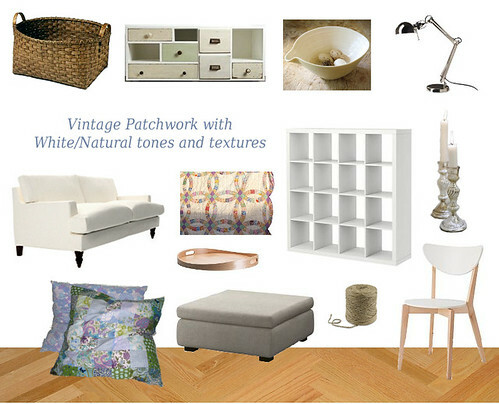 In any case, I have been thinking about how I'd like our new space to look, and I made the "mood board" above to try to clarify my ideas. Hopefully it will help keep me on track when in the shops! All through Christmas, as we saw family and friends, they all asked "Are you excited?" with expectant faces. The thing is, after so much uproar of selling our stuff and camping out in our apartment rather uncomfortably and rushing to get appropriate papers signed and stamped, we didn't actually feel that excited anymore. When it was all theoretical and the work of it was in the future, it was very exciting. Being in the process of moving, rather than before it, or finished it, wasn't as fun. All the potential of travel and new places and people and strange things to eat had been rather overwhelmed by paperwork and stress. And it's still feeling that way now that we're here. There's a labyrinthine process in order to get our government numbers, find an apartment, open a bank account and move moola into it from Canada, sign up for health insurance. And then there's all the little things that come so much easier in one's own country, like knowing which laundry detergent to buy and which slot it goes into on the machine. I'm not really meaning to complain here, but more I wanted to be honest about how it really feels at the start of being an expat. And let me tell you that we've had it easy! Damian's company here has hired an immigration lawyer to do most of the paperwork for visas and file everything appropriately; they also set up our appointment at the (awesome) Expat Center, put us up in a long-stay hotel for the first month, and pointed us to a reputable housing agent. I can't imagine how much more complicated and stressful it is for people relocating without all that support. On Tuesday we got our all-important BSNs (the name for the government-issued number), and we went on a tour of some apartments with the housing agent. We've tentatively found one, but I don't want to jinx it until everything is signed. 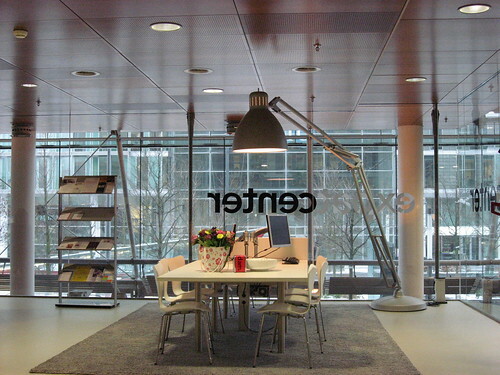 As we were in Amsterdam (our temporary home is in a suburb called Amstelveen), I hung out for the rest of the afternoon until Damian was finished work. I walked around a bit and took pictures, feeling briefly like a tourist again. 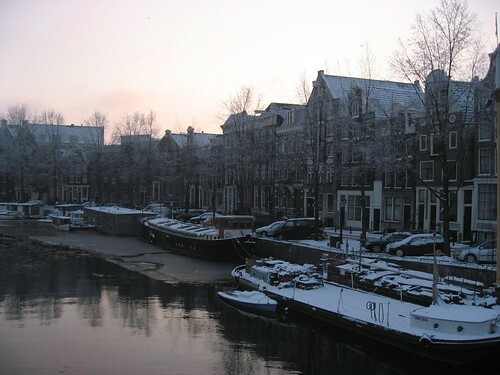 We've been told that to see Amsterdam like this, with all the snow and ice, is very unusual. 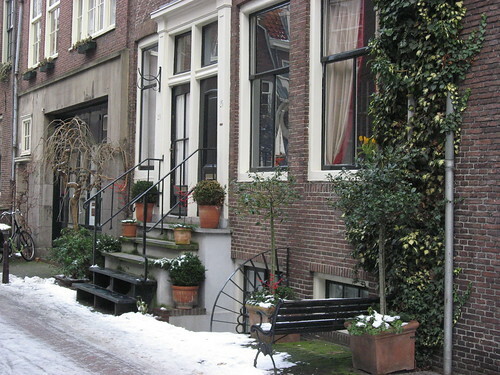 When I got too chilly, I found a café and drank koffie verkeerd (café latte) and read Mansfield Park. It was the first fun moment I really felt like I lived in Europe. So there are moments of excitement starting to peek through the paperwork! (More of my new pictures of the city will be added to the end of my Amsterdam, Netherlands set, following the ones from our holiday in September and my pictures related to moving are here). As planned, I finished my quilt over Christmas. It went much quicker than I expected, actually. 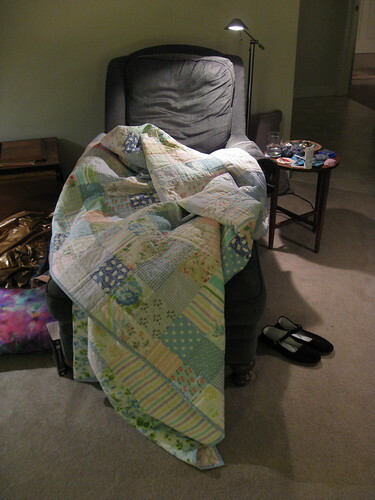 A couple days snuggled into The Green Chair, and all the hand-sewing was finished. (I found the description and pictures on this tutorial very helpful.) The Green Chair lives in the country home of my in-laws. It is where I learned to crochet and knit and where many a project (and book) has been started or finished. The Green Chair is also an exceptionally good spot for a nap. 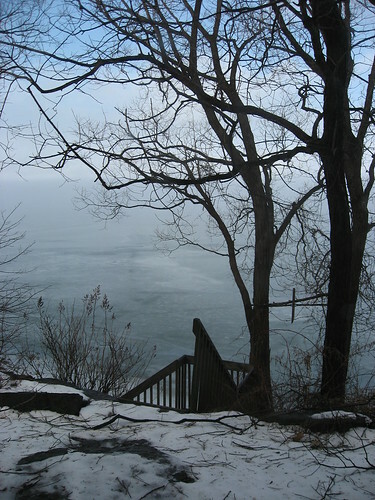 The views were very grey and blue and white over our Christmas holiday, making it appealing to stay cozy under a quilt and do a bit of hand-sewing. 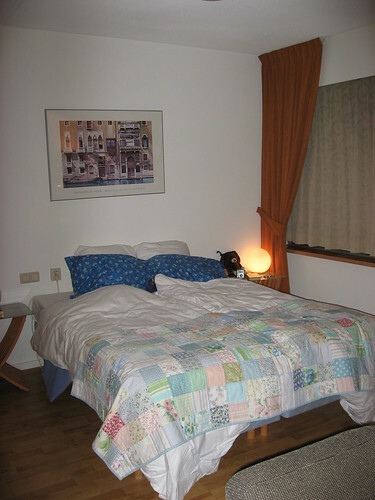 The quilt has now arrived with us in Amsterdam and was the first thing out of my bag to turn our temporary hotel-apartment into somewhere home-like. Not to mention making the twin beds with the Dreaded Gap seem a little less separate! Having our own pillows was also so worth it, despite how stuffed our luggage was. 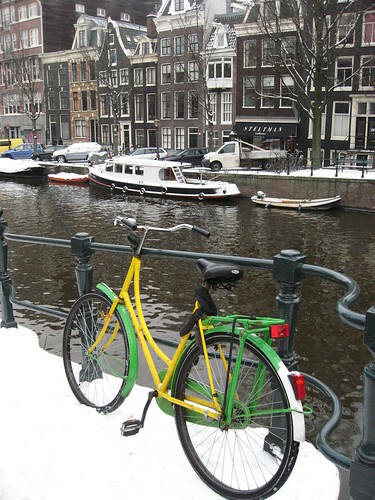 More about our Adventures in Amsterdam to soon follow!